This delicious raw pizza recipe was provided by Raw Chef Chris Kendall RHN of The Raw Advantage. 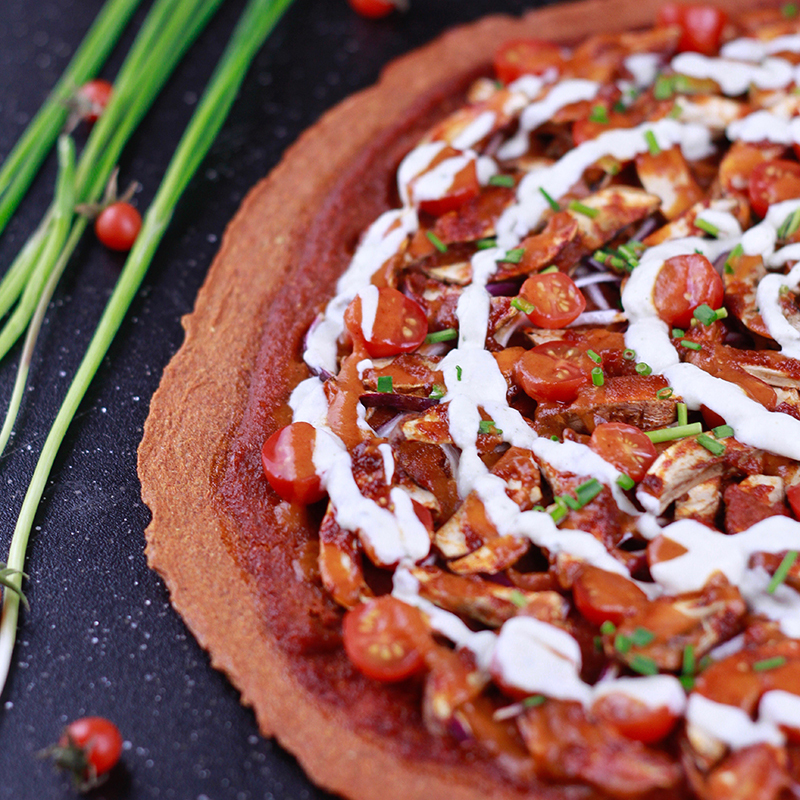 For more delicious Raw Pizza recipes, check out his Frickin' Rawesome Pizza Recipe book here. Total recipe takes approximately 10-12 hours. 1Wash tomatoes well and slice into small cubes. Add to high powered blender. 2Add buckwheat, psyllium husk and clove of garlic to the blender and blend until smooth. 3Pour mixture in the center of a ParaFlexx sheet lined Excalibur Dehydrator tray. 4Use a large flat knife or spatula to spread into a round pizza crust. You want the crust to be about as large as the tray and just 1/4" thick. 5Dry in your Excalibur Dehydrator at 118 F for 4-5 hours. 6Once the top is fully dry, flip the crust over on the tray and peel off the ParaFlexx sheet. Place the crust back into the dehydrator for 1-2 hours more until fully dry to the touch on both sides but not crispy. 1Wash tomatoes well and dice them. 2Add all sauce ingredients to high-powered blender and blend until smooth. 1Wash and peel the zucchini, then chop into cubes. 2Chop the bottom whites off of the green onions. 3Add white portion of green onions, zucchini, hemp seeds/cashews, dates, and lemon juice to high speed blender. Blend until smooth. 4Loosely chop the green onions and add to the blender along with parsley and Italian seasoning. Pulse a few times to mix well leaving small bits of green onion and herbs. 1Pour 1/2-2/3 of the Smokey BBQ sauce on top of the dried pizza crust. Spread evenly edge to edge. 2Add the toppings (sliced tomatoes, mushrooms, and red onion) to bowl. Add lemon juice, smoked paprika and garlic powder and mix well. 3Add the remaining Smokey BBQ sauce to the toppings and mix well. 4Pile all of the toppings on top of the crust in an even layer. 5Slice the pizza into 8 pieces. 6Carefully move the pizza slices back to the Excalibur Dehydrator tray. Keep the slices separated slightly. 7Dry at 118 F for 2-3 hours, turning the tray halfway through. 8Slide pizza out of the dehydrator. Drizzle the with Rawkin' Ranch Sauce on top & serve.